Why would a car company want to operate out of Silicon Valley? For starters, consider that about 20% of a car's value is now comprised of electronic components, and this could reach 40% by 2015 - in true compliance with The Impact of Computing. This is already greater than the dollar value of steel or rubber in the typical car, and signifies the gradual shift of yet another technology into an information technology. Silicon Valley's first car company, Tesla Motors, was founded in 2003. Their first product, the Tesla Roadster, was unveiled in July 2006, and is a fully electric $100,000 car that can accelerate from 0 to 60 mph in just 4 seconds. The cost of the electricity consumed is estimated to be as little as 1 cent per mile. Pre-ordered units will be delivered to customers in early 2008. 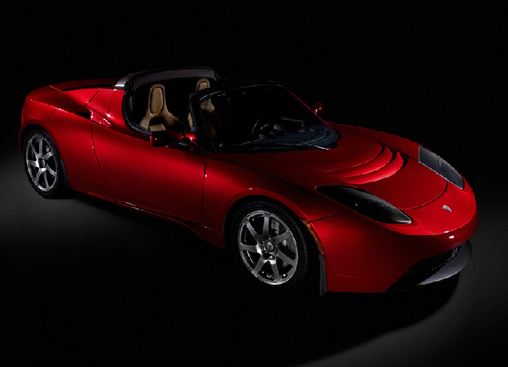 However, the initial Tesla Roadster is merely a symbolic product exercise for Tesla Motors. The real market-shaker is the subsequent 'White Star', a 4-door family sedan using the same electrical technology that could be released as early as 2009. It is expected to be priced at $50,000 to $70,000, and compete with BMW, Lexus, and Mercedes sedans. It is possible that by 2012-13, a 4-door sedan that reaches middle-class pricepoints could be available in substantial quantities, along with Tesla's service support infrastructure to go with it. The benefits of a fully electric car that consumes just 1 cent of energy per mile are numerous, of course. From a decline in the quantity of oil imported from the Persian Gulf, to an increase in the purchasing power of the average American, to a contraction of the US Trade Deficit, to a reduction of atmospheric pollutants, there are many benefits to our society if this technology can scale into replacing a significant slice of US automobile sales by 2015. Tesla Motors has a blog with a lot of good information as well, including the rate at which they expect cost efficiencies to manifest themselves. Whether Tesla Motors succeeds in its long-term vision remains to be seen, but they have done well enough so far to merit watching closely. Update (3/15/07) : Tesla is opening 5 dealerships across the United States. Go see one, if you are in the same areas. You are in denial. The concept is old. Electric cars have been produce by GM and withdrawn from the market. These are not cost effective. I can buy a $10000 car and a couple lifetimes of gas for a lot less than $50000. The efficiency of batteries and solar panels are both much better than they were in the 1970s. They continue to improve about 5% a year, which is slow, but still adds up over many years. The $10,000 car you mention would be the bottom of the bottom. The 2012 version of Tesla's car could be as little as $40,000, and cost almost nothing in fuel, making it cost effective with $30,000 gasoline cars. Small, incremental changes that add up over 8-10 years is the goal. Jeffolie, remember when DVD players were $3000 a piece? Now you can get one for $30. The rich guys who shelled out $3000 for a DVD player financed the mass-mfg factories that churned out the $30 players. Did you even read the Tesla motors blog that GK linked? I do not know about the exact design they are planning, but with an electric car, you can probably just put motors (with some gears/flywheels) on the axle, and do away with the transmission. Once mass manufactured, I think the Li-Ion battery pack+motors will be cheaper to produce than the gasoline engine+Transmission of a typical car. Also, the weight will also reduce. Yeah, I saw that car at the SF auto show, (it was right at the foot of the stairs, you couldn't miss it) -- It's nice to see that the "car industry" is actually spending development and R&D money into electric cars. Exactly. The difference between this and previous electrical cars is not just the technological advancements, but that this is 'cool'. It will become a status symbol as new green tech also becomes fashionable. In 20, 30, 50 years maybe these 'dream electric cars' will be mass produced. I have seen dream cars produced in the 1939 World's Fair, futurama, and science fiction. Making it to mass production is nowhere close to happening in the near future. You aren't providing any reasons. Precisely what technological obstacle prevents this from happening? The 'cost-effective' point is already countered. Note that hybrid vehicles already exist in much greater numbers than 3 years ago. In 2001, you probably thought hybrids had no prospects. Also, do you deny that batteries and solar panels are both improving at 5% a year? That is a slow rate, but still adds up over 10, 20, or 30 years. Fuel cell technology, gas turbines have been around for decades but have not made it into mass production for cars. They were not cost effective. History is replete with 'dream' cars. Again, unless you can answer the specific questions, your argument consists of nothing more than "It can't happen because it hasn't happened yet.". 1) Batteries improving at a rate of about 5% a year? 2) Photovoltaics (solar panels) improving their cost/energy equation at 5% a year? Your cost-effectiveness point is already countered. Furthermore, people don't avoid BMWs and Mercs because they are not cost-effective against Hondas and Toyotas. Brand can trump cost-effectiveness for premium consumers, and often does. Tesla is building a brand. Interesting article. Any idea on where I can get more information on this? Spending 1 cent per mile, there is no better deal than that. Everybody should have a car like that. So why everybody does not go buy a tesla roadster? I personally think they must. Here is a thought: Toyota looses money on every Prius they sell. It costs more to make (at the present time) than the average car with an internal combustion engine. The Prius also requires more energy to produce than the average car with an internal combustion engine, making it not "green" by any stretch of the word. Then there is the battery replacement... Batteries don't last forever, therefore they will need to be changed at some point. At what cost will the hundreds, and in some cases (as with the Tesla) thousands of batteries be? How often? Also keep in mind where the electricity is coming from... most likely it is a coal powered power plant (although some may be nuclear, hydrothermal or hydroelectric). You are still polluting the air by charging your vehicle, unless you know for certainty, that in your area, you are getting your power from the latter three I mentioned in the sentence above. "Green" cars, at the present time, are FAR from "green". If anything they are no better, if not worse, than the internal combustion engine. Instead of using electricity, why don't we keep our gas powered cars and run them on algae-based fuels? We can stop being dependent on the Middle-East, and have algae farms located in the deserts where the sunlight is plentiful and perfect for algae growth. I read that if an algae production plant had 30,000 acres in the desert, they could produce enough fuel to satisfy the needs of the entire U.S. Algae farms use closed systems, so the water is recycled (topped-up when necessary) and uses a fraction of the resources that a corn field does. (I have no idea WHY anyone would be ignorant enough to use part of your food supply to fuel your vehicle). The answer is very simple and has already been field tested and proven to work just as well as fossil fuels, without the harmful aftermath. Just a thought and my 2 cents worth. Have a great day! I believe you would divide 55 into 220. That number would give you the amount of kwh per mile, over 220 miles. The 220 miles is relative to your style of driving though. its good enough that it makes you want to buy the car. Previous models like the EV1 despite the backing of big companies like general motors had little style, I liked your blog it’s very interesting, your information had helped me very much, Please keep on posting the related information regarding this Article. Took me awhile ll the comments, but I really love the article. It proved to be very useful to me and I am surall the commenters here!